Where is this year going in such a hurry? « You know… that Blog? Where is this year going in such a hurry? I haven’t had time to do much blogging lately, but it’s not because I don’t want to! Seems every time I turn around I see something I want to write about, but then life gets in the way, and the idea is lost. I really need to keep an idea list on my iPhone – because I am usually running around when these things occur to me – although I do jot things down in my journal quite often. The year is flying by though, and the ideas tend to get buried. Where is this year going in such a hurry, anyway?? Our house is coming along – it’s still a semi-formed pile of 2x4s and concrete just now, but I was standing in my still-open-to-the-sky living room the other day, and that’s progress. Actually, the way they’re going we could be in earlier than our August 9th possession date (3 months, 2 days from now!). Time and weather will tell! We met several of our neighbours on Saturday night when we were there poking around, who I had spoken to online previously, but not yet met. One absolutely adorable couple who just found out they’re expecting their first baby, and one other gal. The adorable duo will be 2 doors down from me on the left, and the other gal and her husband will be 6 doors down from me on the right. I’m both excited and disappointed in it. It’s far smaller than we’re used to, and that will be the biggest issue, I think. It’s exciting to be “in town” again, for sure. No more dealing with a well and septic system! Not excited to be having neighbors that close to me though. We have been spoiled living here in the country, and as much as most people think otherwise, I’m not a real people person. I like my privacy, and I like space. I won’t have much of either at the new house! That’s ok though; this is not our “forever” home, and we’ll most likely sell and move somewhere more ideal in a couple of years. In the mean time, we will make the most of it! Been busy buying things – except for our bedroom sets, our furniture is too big to fit in the new space, so my folks will have a lot of it in their basement for the foreseeable future! I bought the central vac package a few weeks ago, some end tables, new dishes, cutlery, pots and pans… Hey, new house = new stuff, ok?? Besides, the Teen is going to be starting off on her own in a few years, and she can have all the still-great stuff we’re upgrading from. Totally makes sense to buy all new stuff! Shut up. Now I have to think about paint colours. The ceramic tile from the front door/foyer through to the kitchen, powder room, and landing on basement stairs is a rustic brown. The hardwood floor in the living room and both stair cases is “cinnamon” stained oak. The cinnamon is a medium-dark stain that is neutral enough that I’ll be able to add other wood… like the espresso kitchen set I have my eye on, and the matching espresso island I am designing. Carpet upstairs and in the finished basement is grey. I have been thinking about maybe a “Silver Mist” grey (Benjamin Moore collection) or a darker blue-grey (like Benjamin Moore “Silken Blue”) with white baseboards, crown moulding, etc on the main floor and up the stairs, which would look lovely over the dark floors. I’m sick to death of the classic “beige and white” colour scheme that is so common these days! I like the coolness of the grey, which will look blue in bright light, and love the clean contrast between white and grey. What do you think? I’m open to suggestions (and pictures!) although I’m leaning towards the darker of the two paint colours. Frankly, I’ve changed my mind so many times I’ve managed to boggle my brain! 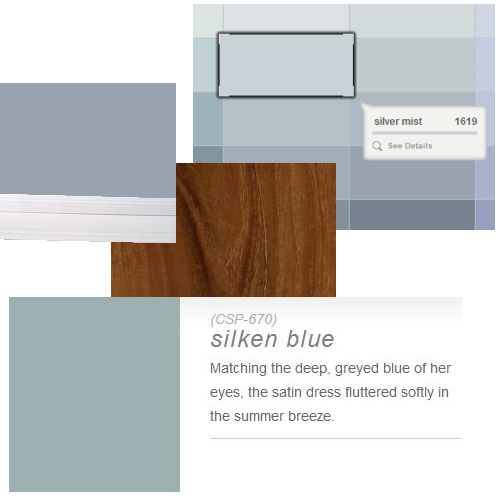 I *love* the silver mist with that wood grain–very pretty! I bet it’s very exciting to see the progress on your house. They are both good colour choices. It will be hard to choose for certain until you see the lighting situation in the finished house — but please do avoid beige at all costs!! Good luck! i have the same problem with ideas and blogging at the moment. Love the new house excitement, though! !